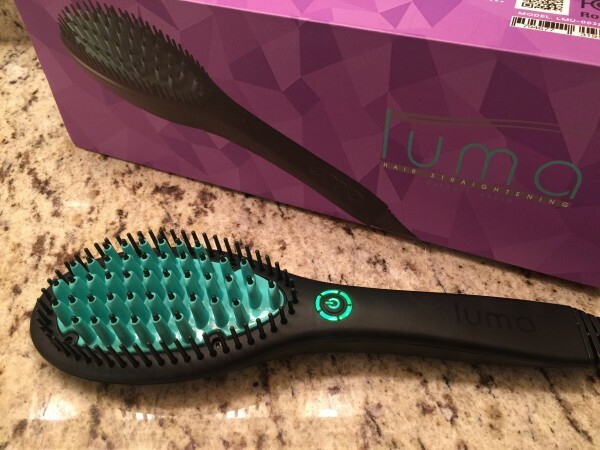 Luma Brush Demo and Video Review – Easiest Way to Straighten Your Hair! WOW! We are completely obsessed with this new beauty tool that makes straightening your hair SO easy. The Luma Brush is a ceramic hair brush that heats up and you can literally straighten your hair simply by brushing it with this tool in 2-5 minutes. It’s incredible and so much easier to use than a flat iron – and FAR quicker too. Hooray! Check out our Luma Brush Demo and Video Review below to see how easy it is to use and the great results we got straightening both my hair and Kenzie’s hair. So what are the key things you need to know on how the he Luma Brush works? Honestly, there is NOT easier or faster way to straighten your hair. I am AMAZED at how fantastic this worked and how easy it was to use. The Luma brush heats up in 60 seconds and you can literally straighten your hair in a few minutes. The ceramic brush heats to 365 degrees so it gets HOT which is what you need to straighten your hair. However, what I love, is that thanks to it’s “hairbrush” style design the risk of burning yourself seems to really diminish compared to using a flat iron since it is so EASY to simply BRUSH your hair compared to needing to place hair within the scalding hot flat iron plates or twisting it in a curling iron. Priced at $79.99 I think this is a real value given how fast it heats up and how tremendous it works at straightening your hair quickly compared to other styling tools. It’s comfortable to use and works fabulous. You can buy online at http://www.lumabrush.com. Designed with a wide, 3D hot ceramic surface and spring-backed, plastic heat-insulated bristles that contour to your head, there is no more need to section hair using clips, go over the same part again and again, or burn your scalp in order to get close to the roots. Luma Brush heats up to a constant temperature of 185/365 F in 60 seconds and contains an original MCH heater built in that delivers steady and consistent heat and results every time. Note: Thanks to Luma Brush for sending us this sample unit to facilitate our review so we could try out their new styling tool. As always all thoughts and opinions are our own. CSR2 is about understanding the machine it is on, doing comparatively little and making it stunning. Good review but I really prefer my Karmin brush I love it. Thank you for letting other people to know about it.I’m impressed by the admin of this post .This is very helpful information for me.